May 2, 2016- The College of the Ozarks will host A Patriotic Tribute – A Solider’s Journey to welcome Dr. Bruce Heilman Monday, May 2, at 9:00 am. 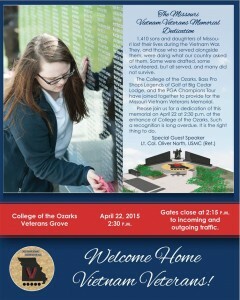 The public is welcome to attend and will take place at The Missouri Vietnam Veterans Memorial. 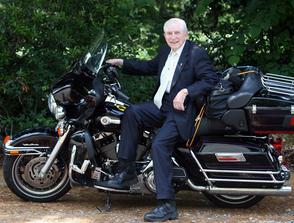 Heilman will stop at the C of O on Monday as part of a cross-country motorcycle tour to visit memorials throughout the U.S.
Dr. Heilman is 89 years old and served his Nation as a Marine in World War II in the South Pacific and Japan. He has covered more than 140 countries as he has escorted travel groups abroad annually for more than 30 years, and is a member of the Leathernecks Motorcycle Club International. For more information please contact Valerie Coleman, public relations director, at 417-690-2212. 1,410 servicemen and women from the state of Missouri gave their lives during the Vietnam War. The fallen will be honored through an official Missouri memorial on the campus of College of the Ozarks in Point Lookout, Missouri. The dedication of the memorial will take place at the College on Wednesday, April 22, 2015, at 2:30 p.m. The public is invited to attend. The purpose of the memorial is to honor the fallen and properly thank Vietnam War Veterans for their sacrifice and bravery. The memorial is being constructed by staff and students and will stand near the College’s entrance. The speaker for the ceremony is former U.S. Marine Corps Lieutenant Colonel Oliver North. A decorated Vietnam War Veteran, North serves as host of the FOX News Channel documentary series “War Stories with Oliver North.” He is not only a combat-decorated Marine, but he is a #1 best-selling author, inventor, business owner and syndicated columnist. North has previously served as a convocation speaker at the College of the Ozarks. The ceremony will begin with The Call of Remembrance, the music of a single bagpiper playing “Amazing Grace.” Walls containing the names of the fallen will be unveiled and wreaths placed on them by dignitaries. A 21-gun salute will further honor those who gave the ultimate sacrifice. Alumnus and Vietnam Veteran General Terrence R. Dake will address those gathered. Additional special observances, musical numbers from the College’s choir, and opportunities for prayer and reflection are planned as part of the service. At the end of the ceremony, family members of the fallen, and others wishing to show their respect, will place single roses at the base of the walls. The roses will be provided for those in attendance. A reception for all those in attendance will be held immediately upon completion of the dedication ceremony at The Keeter Center on the College of the Ozarks campus. Families of the fallen are urged to call the College at (417) 690-2212 to share their information. They will be recognized with special observances during the ceremony. These names will be carved into slabs of granite, immortalized on a divided wall which is the focal point of the memorial. The division of the wall represents the divide that separated the country during this conflict. In between the two walls will stand a statue of Vietnam Veterans, representing those who served in Vietnam and returned home to live the rest of their lives with memories of war. A flower bed in the shape of the letter “V” for valor will display red flowers, representing the blood shed by servicemen and women. The memorial was designed by Austin Meyer, a 2014 College of the Ozarks graduate. Former U.S. Marine Corps Lieutenant Colonel Oliver North was born in San Antonio, Texas, graduated from the U.S. Naval Academy in Annapolis, Maryland, and served 22 years as a Marine officer. During the Vietnam War, he led a counter-insurgency Marines platoon. His awards for service in combat include the Silver Star, the Bronze Star for valor, and two Purple Hearts for wounds in combat. assassination by Abu Nidal, the infamous terrorist killed in Baghdad in August, 2002. Since 2001, he has been the host of “War Stories” — the award-winning military documentary series on Fox News Channel — and has been embedded with more than 55 U.S. and allied combat units. North has authored thirteen books, all of them New York Times best sellers. His latest, Heroes Proved, is a gripping tale of intrigue and duplicity at the highest levels of the U.S. Government. In addition to his work on FOX News Channel, North also serves as the honorary chairman of Freedom Alliance, the conservative public policy organization he founded in 1990. Freedom Alliance provides tuition assistance to dependents of troops killed or permanently disabled in the line of duty. Freedom Alliance also provides support to members of the armed forces who have been wounded in the line of duty, those currently serving on the front lines, and their families. The Keeter Center is excited to host our Annual Chocolate Lovers’ Tea in December. The cost is $35 inclusive of service charge and tax, per person and includes a Chocolate selection designed by our Pastry Chef, as well as our specialty hot teas and cocoa, selection of tea sandwiches, pastries, scones and music by a student musician and an Ornament Exchange. Seating is limited, reservations are required and can be made online at www.keetercenter.edu/events. Join us for our “Afternoon Tea” at The Keeter Center. We will be celebrating Root Beer Float Month and offering a tour of Nettie Marie’s Creamery! The cost is $35 inclusive of service charge and tax, per person and includes our specialty hot teas, selection of tea sandwiches, pastries, sweet breads and music by a student musician. Seating is limited, reservations are required and can be made online at www.keetercenter.edu/events. Join us for an educational opportunity rarely offered, a day of farm-to-table cooking with award-winning Executive Chef Robert Stricklin. The cost is $89 ++ (service charge and tax) per person and includes a Welcome Reception, garden tour, cooking school and Nature’s Harvest Lunch. Seating is limited, call now to reserve your space. Children between the ages of 8-14 years old will learn basic etiquette such as: table manners, table setting, introduction and proper handshake, proper dress, proper posture, etc. This is a great learning experience for children to develop themselves into fine young men and women. The cost is $25 per student, which includes lunch and a completion certificate. Seating is limited, reservations are required and can be made online at www.keetercenter.edu/events.